resin pro 4.0.49 Full Cracked download. Recently, we decided to spend some extra time improving Resin’s performance and scalability. Since we like challenges, we set a goal of meeting or beating nginx, a fast C-based web server. When working on performance, we use benchmarks to see which proposed changes improve Resin’s performance, and which proposed changes do not. The autobench/httperf benchmark is particularly interesting because it simulates high load rates and exposes scalability issues better than some other benchmarks like ab. 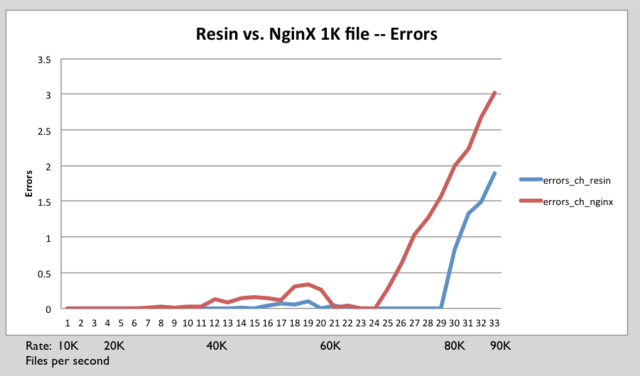 After completing the Resin performance work, it turned out that we exceeded our goal and were actually able to beat nginx, and thought we’d share our results. 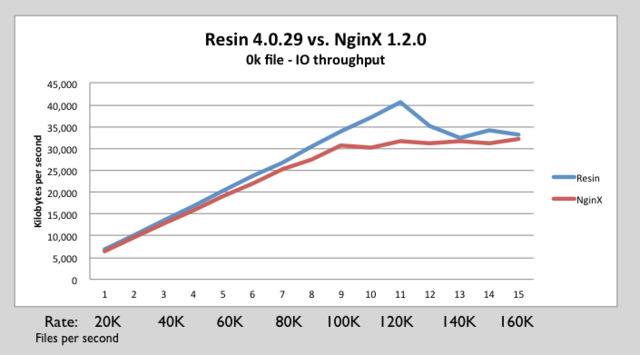 We have recently run some performance benchmarks comparing Resin 4.0.29 versus NginX 1.2.0. 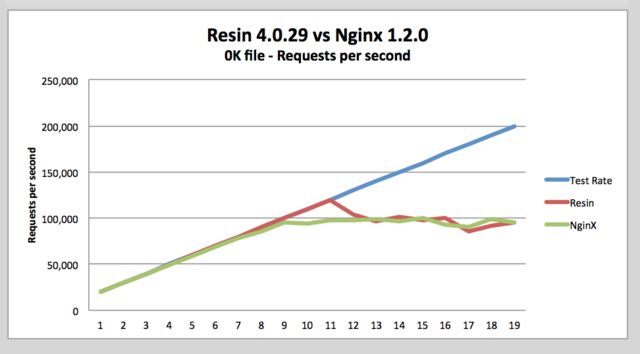 These benchmarks show that Resin Pro matches or exceeds NginX’s throughput. We tested 0k (empty HTML page), 1K, 8K and 64K byte files. 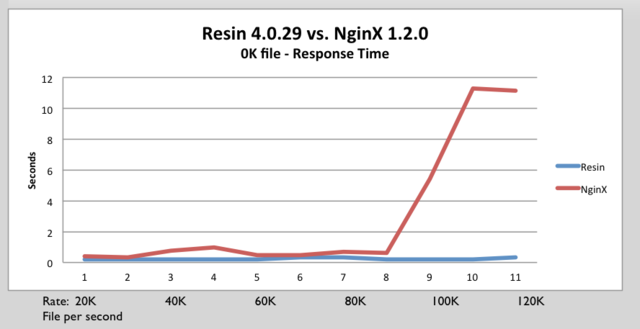 At every level Resin matched or exceeded NginX performance. httperf is tool produced by HP for measuring web server performance. The httperf tool supports HTTP/1.1 keepalives and SSL protocols. Autobench is a tool for automating the process of performing a comparative benchmark test against two a web servers. Autobench uses httperf. 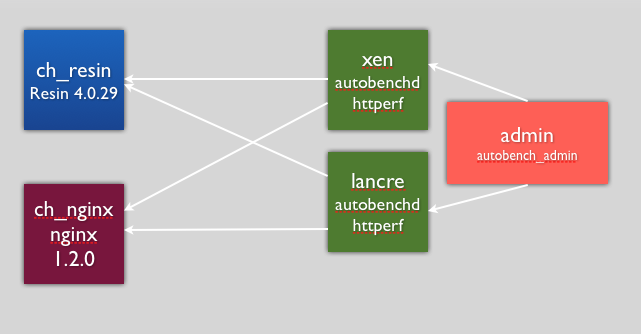 Autobench runs httperf against each host. AutoBench increases the number of requests per seconds on each iteration. AutoBench delivers output in a format that can be easily consumed by spreadsheet tools. AutoBench has a mode where it can drive multiple clients against a set of servers to minimize the possibility of testing your client throughput instead of server throughput. The command autobenchd is used to run a daemon on client machines. The autobench_admincommand drives many clients to run test at same time by communicating with autobenchd. The only change that was made was the worker_processes were set to 8 for NginX to improve throughput. i7 4 core / 8 HT, 2.8 GHZ, 8Meg Cache, 8 GB RAM. We want to make sure Resin can handle as many concurrent connections as possible without glitches or blocking. The tiny 0k file is a good test for high concurrency, because it spends less time on network overhead and more time stressing the threading and internal locks. Because we used an 8-core machine, we can be certain that we’re avoiding unnecessary locks or timing problems. For most sites, the small file stress test simulates heavy ajax use, and small file use. As sites become more interactive, this small file test becomes ever more important. As a comparison of a threaded Java web server with an event-based C web server, the 0k test is a good test of the threading and event manager dispatch. Because most of the time in the test is establishing a connection or switching between requests at the very highest rate, both the threading and the event management get a tough work-out. Above is used to setup 300,000 connections at a rate of 20,000 to 200,000 requests per second. Each iteration increases the rate by 10,000 from 20,000 to 200,000. It’s been an exciting year for the mobile Web. Adoption of HTML5 and CSS3, improved performance in mobile browsers, and an explosion of mobile app frameworks mean it’s more feasible than ever to create rich, interactive Web experiences for mobile devices. Using a wrapper like PhoneGap, you can distribute them via the native app stores for iPhone, iPad, and Android —targeting multiple platforms with a single code-base. But even in my simple test app there were performance issues. Page transitions can be jumpy or missing, and there are periodic delays in responding to tap events. And while the project is technically active, the original author has moved on and development seems to have slowed. jQTouch is available under the permissive MIT License, one of my favorite open source licenses. jQuery Mobile was the new kid on the block. Announced in August 2010, it’s quickly progressed to a very functional Alpha 2 and now on February 28 it comes with a JQM 1.1.0. It takes a similar – but more standards-compliant – approach to jQTouch and feels very much like that framework’s successor, with a broader array of UI controls and styles. jQuery Mobile’s performance is variable (though better than that of jQTouch), particularly in responding to tap events rendering animations. It also lacks a small number of key programmatic hooks that would permit easy creation of more dynamic apps. For instance, there’s an event that triggers when a page is about to load (i.e. slide into view) but no way to tell the associated handler code what UI element resulted in the page switch, or to pass additional information to that handler. I was able to create workarounds but hope that future versions will take a cue from jQTouch and build out this functionality a little more. In the 2011 end and the starting of 2012 the JQM catched the eye of lot of web geeks. And it is the most improving framework in the Mobile Web industry. jQuery Mobile is available under either the MIT or the GPL2 license. Sencha is far more extensive than its competitors, with a vast array of UI components, explicit iPad support, storage and data binding facilities using JSON and HTML5 offline storage, and more. (It’s very cool to manipulate app data in one of Sencha’s data structures and watch the corresponding list update in real time.) It’s also the only Web framework I’ve seen with built-in support for objects that stay put (like a toolbar) while others scroll (like a list). For all that apparent extra weight, Sencha performed noticeably better and more reliably than either jQTouch or jQuery Mobile in my tests, with the exception of initial load time. When working with a library or framework, it’s usually counterproductive to “fight the framework” and do things your own way. Given how extensive Sencha Touch is, that means your app will probably end up doing just about everything the Sencha way. I’d originally usedWebKit’s built-in SQLite database for offline storage but ultimately eliminated both complexity and bugs by moving that functionality into Sencha’s data stores. The documentation, while extensive, has odd holes. Between those and the sheer size of the framework, I spent a lot of time fighting bugs that were difficult to trace and to understand. Responses to my questions in the developer forums were more frequent and helpful than with the other frameworks, but still ultimately insufficient. Sencha provides paid support starting at $300/year; I strongly considered purchasing it but oddly, their response to my sales support inquiries was incredibly underwhelming given my interest in sending them money. Sencha Touch is available under the GPL3; under a somewhat confusing set of exceptions to the GPL that seem similar to the LGPL; or under a free commercial license. But that advantage is also its greatest disadvantage: you can only target the platforms Titanium supports, and you’re tied to their developer tools. As if to prove this point, my test app quickly got into a state where it wouldn’t launch on the iPhone. Titanium doesn’t include much of a debugger; Titanium projects can’t be run and debugged in XCode; and it ran fine in the simulator, leaving me with no real way to attack the problem. Rebuilding my app on three of these four frameworks was tedious but educational. I like jQTouch but have trouble believing it will evolve much from here. I’m rooting for jQuery Mobile for its simplicity and its very Web-centric approach to development…but it lacks a few key features and doesn’t perform as well as Sencha Touch. It’s unfair to compare an Alpha 2 product with a 1.0 one, except in one respect: I need something now. Which brings me to Sencha Touch. I was initially impressed with its performance and breadth, but put off by its development style. As I’ve dug in, the holes in its documentation have been frustrating but the breadth has continued to impress me, and I’ve gotten more used to the coding style. The option for paid support is tempting, and I’d probably buy it if they’d answer my emails. But for now, Pints is a Sencha-based app. I haven’t answered the big question: can a Web-based app really hold its own alongside native apps? And if so, are the challenges of getting it there worth the benefit of a single codebase? The answer is YES ! Because the Web-based apps needs the core knowledge of HTML5 and CSS3.